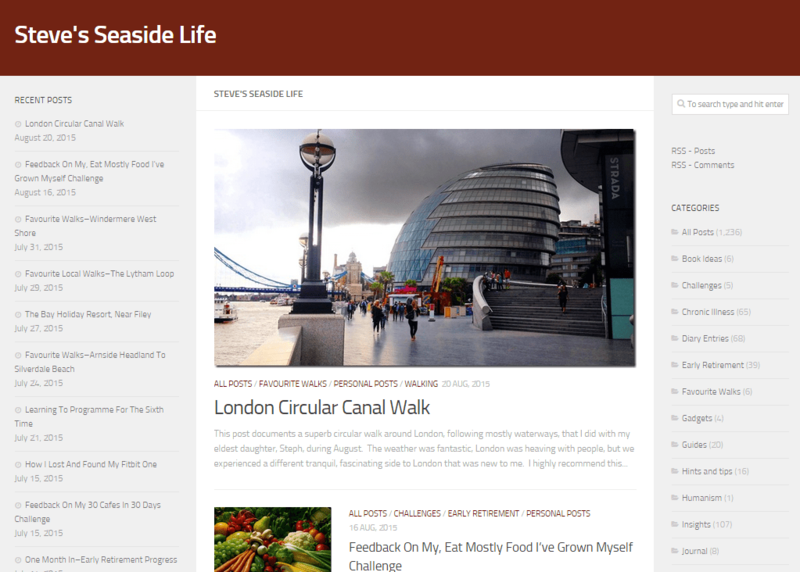 I’ve had a clean and simple design for my blog for a decade or more, but change has been long overdue. 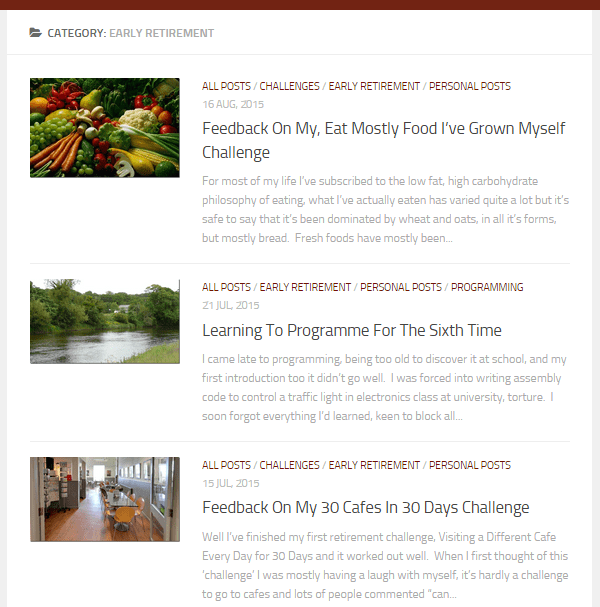 I’ve been looking for a new template for a while, and I also needed a theme that would accommodate my diary and well as my blog, within the same site. The Hueman theme provides a large photo for the latest post, but with smaller thumbnails for the rest, providing plenty of space for the excerpts, that it automatically creates. The theme handles mobile devices, with smaller screens very nicely. By default it shows the main body of the blog, with the sidebars easily accessible with a single click on the chevrons, as shown below. I was particularly pleased with how the theme handles this. Clicking on a category lists the associated posts in exactly the same way as the home page, but clearly shows the category being viewed in the header. Search is handled in the same way as categories, and the search box is easy to find in the top right and nice and big. Previous posts are on the left, categories are on the right, simple. I’m currently planning to write a diary post every day, which would really clutter up my blog’s home page, so they can’t show up there. 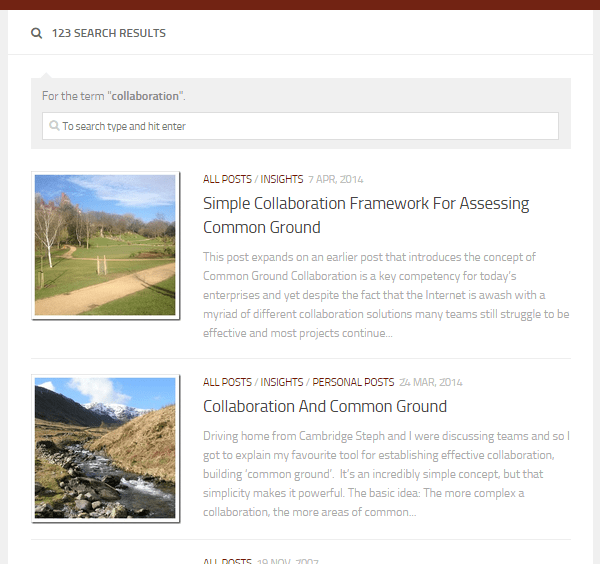 However diary posts still contain a lot of useful information so I wanted them accessible via search. So I used a the https://wordpress.org/plugins/wp-exclude-from-homepage/ plugin to remove them from the home page and from the sites main RSS feed. I use the Memento app on my iPhone as my diary, it integrates tweets, Instagram photo’s and blog posts, and Moves location data into a really nice diary interface, with excellent search. Clearly I needed my diary entries to be integrated too, so I needed an RSS feed for just the diary category. To do this I used a code snippet that I added to the sites Functions.PHP file, as described in this post. There were a few things that I needed to do to achieve this, the most important one being to use a plugin to set the first image in my post to be the ‘featured’ image automatically. I used https://wordpress.org/plugins/autoset-featured-image/ to achieve this. I also ran a tool to add featured images to all of my old posts. 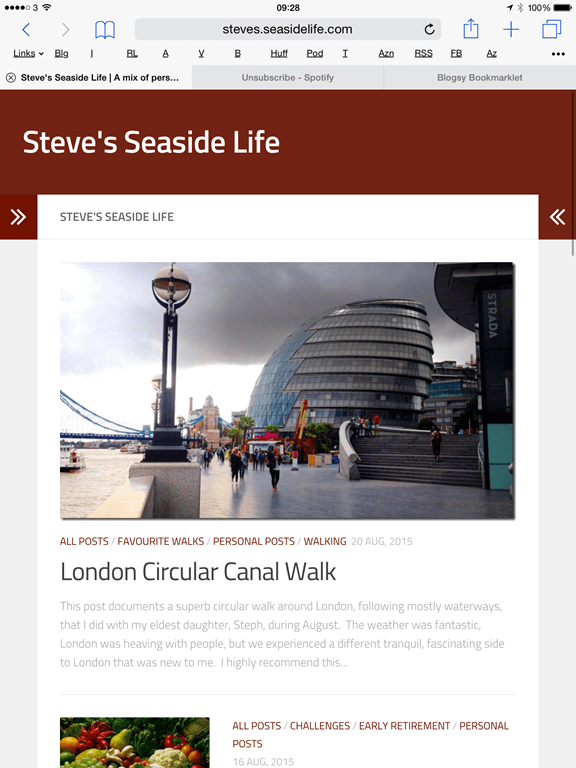 I’m tapping out this post using Windows Live Writer in Caffe Nero early on Saturday morning. It’s starting to drizzle outside so I might stay a bit longer! 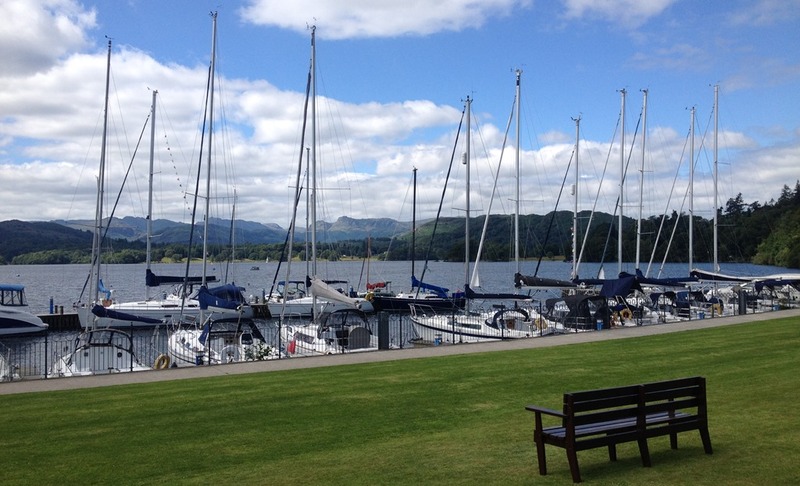 The photo that decorates this post shows the bench that I sat on thinking through these requirements, looking out over Windermere Lake.